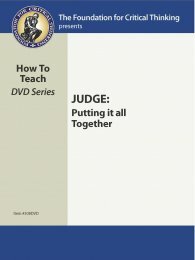 308DVD Putting it All Together (Judge DVD) $14.95	 Qty. When education is fragmented into parts that appear to students and teachers alike as dissociated, little of quality is done, few of the deep, long-term ends of education are well served. Reasoning, critical thinking, creativity, problem solving, communication, mastering content — these are not unrelated dimensions of quality education. They are six deeply interwoven, deeply interdependent processes, fostered by the same modes of teaching. In this tape, Richard Paul demonstrates their intimate inter-connections, relating them to particular teaching processes and strategies.